"This layered meat pie is great if you have the time to prepare it. 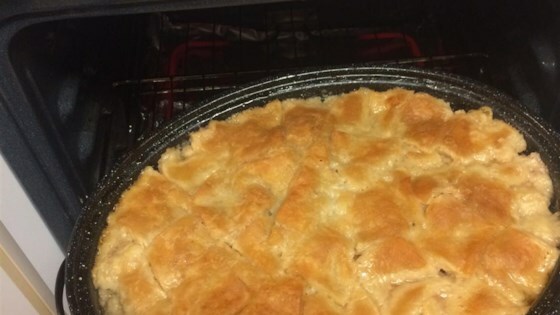 I am not sure where it comes from, but it is delicious if you like meat pies!!" Cut chicken, beef, and pork into 1 inch cubes, and place in a large bowl. Stir in onions. Cover, and refrigerate overnight. Arrange salt pork evenly in the bottom of a 3 quart casserole dish with a cover. Layer with 1/3 of the meat mixture and 1/3 of the potatoes; season with salt and pepper. Roll out half of the pastry a little bit thicker than for a normal pie and arrange on the potato layer, cutting a small hole in the middle. Repeat with 2 more layers of meat and potatoes seasoned with salt and pepper. Cover with remaining pastry, and cut a small hole in the middle of that layer too. Slowly add enough chicken stock through the hole until liquid appears. Cover dish. Bake at 400 degrees F (205 degrees C) for 45 minutes, or until liquid simmers. Reduce temperature to 250 degrees F (120 degrees C). Bake for 5 to 6 hours more, or until top crust is a rich golden brown. This hearty casserole combines ground meat, veggies, and fluffy mashers. My mom makes this pie for every holiday and they call it "Ci Pie" (See pie). Tastes great and not to spicy for kids.